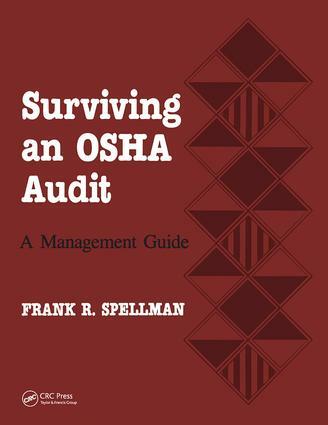 This text is about survival-about surviving an OSHA audit. It's a road map through the process, a template, a user-friendly how-to-do-it manual that should be part of any OSHA-regulated facility's survival package. Will it help you survive an OSHA audit? It can't hurt-and if you follow it, it will help. Frank R. Spellman is the Environmental Health and Safety Manager for a large wastewater treatment sanitation district in southeastern Virginia. He has extensive experience in environmental science and engineering, both in the military and civilian communities. His degrees are in business (BS, MBA), public administration (BA), and environmental science (MS, Ph.D.). In his present position, his responsibilities over the last nine years have included research on air, noise and water pollution control, solid waste management and reuse of biosolids, management of programs dealing with hazardous materials emergency response training, abatement of asbestos and lead, process safety management and risk management planning, as well as general environmental and safety programs. Mr. Spellman regularly consults with area facilities on OSHA compliance, and speaks on several environmental and engineering topics, primarily those dealing with hazardous materials emergency response procedures. A professional member of the American Society of Safety Engineers, Water Environment Federation, and the Institute of Hazardous Materials Managers, Dr. Spellman is a certified safety professional and a certified hazardous materials manager. He has written eleven books dealing with health and safety issues, and with environmental engineering disciplines.